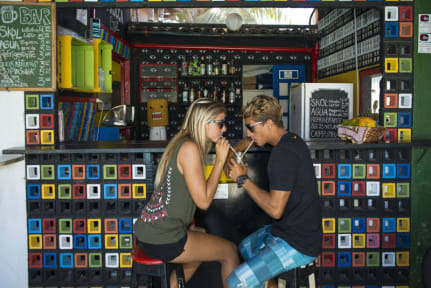 This is the first real place in Porto de Galinhas, with real atmosphere for travelers. Porto de Galinhas, chosen consecutively for the last nine years as the best beach in Brazil) is a small town located in the north east of Brasil, 1 hour from the international airport and the city of Recife (multicultural capital of Brasil and famous by the amazing carnivals). It has rooms with air-conditioning, hammocks and drinks to relax through the year. In addition, our multilingual staff, made up entirely of travelers will guide you on the different activities you can undertake during the day and night as well as help you get discounts on other hostels in the chain, contact us.